The best writing is alchemical: turning words into worlds, characters into trusted friends or bitter enemies, and leaving readers changed. Great literature is not only compelling. It doesn't just claim its space in the literary canon. Novels like Lucky Boy by Shanthi Sekaran do even more; they brand their readers, leaving them forever connected to those marked by the same story. Lucky Boy is the story of two mothers: Soli Castro Valdez, an undocumented Mexican immigrant and the biological mother of Ignacio; and Kavya Reddy, American-born daughter of Indian immigrants, Berkeley grad, and Ignacio's foster mom. After years of staring down the beast of infertility, Kavya is granted a glimmer of hope in a little boy whose mother has been arrested for a minor traffic offense and placed in an "alien" detention center. While Ignacio is the lucky boy in the title, this story belongs to Soli and Kavya. "This story, this fight for a boy—it wasn’t about the boy. It was about his mothers. It was about a law that grew from the deepest roots of their being." To call this book a story is a misnomer. Sekaran has written a scalpel that slits readers from throat to belly, with the repeated question, "Well? What would you have done? What would your heart decide?" At the same time, she faces this central reality head-on: that the deepest loss is only felt in response to the greatest love. While there is plenty of suspense to keep the pages turning, Sekaran's narrative also dives deeply into her characters' inner experiences. She paints vivid portraits of their longing and loss as she expertly balances plot and character development. Hours came and hours went. Somewhere in Berkeley, people were walking into a room, saying things about Soli and her son. A decision would be made. She didn't move from the floor, but curled into herself, her knees to her belly, her breath steaming down her breasts. The sky above was gray like the cushioned walls. Darker gray, and then black. The night passed. She didn't move. The only place she could be was no place. The only safe place for her was this soundless void. 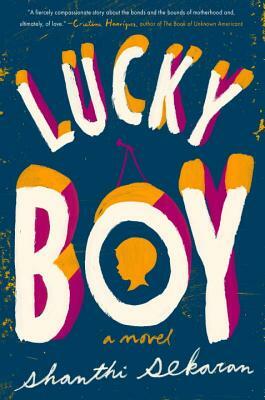 Lucky Boy begins when teenage Soli leaves the small town of Popocalco, Mexico, because "she wanted a life that moved." Her harrowing tale of travel across the U.S.-Mexican border is a novel in and of itself, replete with hunger, gangsters, Soli's unending ingenuity, and finally, her unexpected pregnancy. Sekaran uses alternating chapters to navigate between Soli's and Kavya's stories, not only developing parallels between their struggles but setting them on a collision course with one another. Kavya has been married to Rishi, her college boyfriend, for several years. Infertility tests prove unhelpful—a baby just won’t come or stay. In one powerful scene, Kavya and Rishi turn their radio to news of the 9/11 memorial because it seems, at least, to be something worse than their pain. Kavya's desire for motherhood is visceral, seeping into her every waking moment. All this time, she’d been living for the stolid delicacies of work and marriage, her tidy home, cocktail evenings and yawning holidays. Her grown-up life was fat with pleasure, but after three years, then four and five, the pleasure grew thin. She’d come to Berkeley to find herself, but found that her self was not enough. She wanted a self of her self. She wanted a child. After a miscarriage, Kavya opens herself to the possibility of adoption. Kavya's original faith in the power of hard work had been shaken by the intractability of her infertility, an egg that she just could not crack, no matter her desire, dedication, or ingenuity. Adoption reignites Kavya's flame and she becomes a woman laser-focused on her new plan: to adopt a child who will become her own. Sekaran's portrayal of Kavya develops compassion, depicting her persistence through daily life despite repeated inquiries from friends and family about her pregnancy status. When Ignacio arrives, there is no doubt of Soli's devotion, a commitment so fierce that it will lead her to make unthinkable choices to defend it. Love wasn’t a word that meant anything to Soli, not when she looked at her boy. Love was a television word. Soli held her sleeping son, his fists balled and eyes shut tight, clinging to a dream. What she felt for him was an epiphany. She had awakened, sprouted a new layer of skin, pink and raw and wholly vulnerable. After her arrest, Soli is moved amongst various detention centers. She is never told her location, and it crushes the reader to hear her ask after each move, "Where am I?" How can she get back to her boy in Berkeley, California, when she doesn't even know her starting point? Alien 127676 has no apparent rights, no need to know even what state she's in, or when, if ever, she'll be released or deported. Sekaran's description of Soli's movement through the system is harrowing. The character development is sparser here, often using "the guard" instead of names, portraying the dehumanizing anonymity of the system. So the guard came for Soli. The hope of freedom did flutter past, but vanished as soon as she was handcuffed again. She didn't know what she'd expected, having grown accustomed to a system in which her expectations meant nothing. She wanted only to know where she was going, and why, and where her lawyer was, and whether he'd know where to find her. "Where’s my lawyer?" she asked a guard, who grinned at her, then took her possessions, and handed them to another guard. "Hands" was all he said, and cuffed her wrists together. Kavya and Rishi care for Iggy while Soli is detained, ultimately setting into motion proceedings to terminate Soli's parental rights so that they can adopt him. Kavya is eager to mother Iggy with a love just as intense and all-consuming as that which Soli could provide. "Kavya was Iggy’s mother; this much she knew and had always known. But was Iggy Kavya’s child?" A lesser writer would have made Kavya the antagonist, crafting a heartless cliché to steal Iggy from the angel Soli. Instead, Sekaran has risen above platitudes and generalizations. Faced with two equally compelling protagonists, readers root for both—yet there is only one Iggy. Two mothers and one child. There is nothing to do but to keep reading, letting the discomfort build in the absence of easy answers. That Lucky Boy arrives for its readers within the context of the current political climate makes it particularly timely. Sekaran brings to light the disconnect between the American family court system and immigrant detention centers. In her nuanced and deeply humane portrait of Soli, an undocumented immigrant and mother, the use of the word "alien" to describe human beings becomes unthinkable. Lucky Boy reminds readers that language matters. Despite its political timeliness, this book ultimately transformed my heart and mind on a much more personal level. I continued to ask myself throughout, "What do I want to happen here?" and no answer left me feeling whole. The system that bore Soli into abject poverty, set her in motion across the border, consumed her cheap labor, and took her child is itself the antagonist of this novel, and I couldn't help but root for both mothers to find a happy ending with their son. Ultimately, one mother has no choice but to let Iggy go. Lucky Boy captures those moments on the journey of motherhood where there is nothing to do but choose a path forward from the crossroads of impossibility.